Love is why we surf. It’s why we build boards. It’s not because we love the act of doing these things. It’s that we get to express the love that we have in us through these things. It’s like we have this well that has built up inside us, and its overflowing. That overflow manifests itself through many outlets including shaping, glassing, surfing and family. Tiana and I met in 2006. We had mutual friends through our church, but we hated each other. Not the flirty, schoolyard, I hate you, but actually like you, kind of way. It was a genuine dislike for one another. We were simply on opposite spectrums of life, and we had no problem voicing it. To say we didn’t get along, well that would be an understatement. Despite our differences, surfing was always the silver lining between us. We both surfed before meeting each other, and our friends surfed as well. When we could be convinced to surf together, it felt like it was the only time we didn’t’ clash. God used the ocean to free us. Surfing became the place that connected us, even if in the beginning it just meant we were released from the feelings of wanting to rip each other’s heads off. God has always used surfing to bring us together, and after nearly seven years of marriage, He continues to use it to reconnect us. Shaping surfboards stemmed from a very simple desire to make surfboards the way I wanted. I had ideas and designs I wanted to try that weren’t available to me in the local surf shops. I wasn’t necessarily looking to be any particular type of shaper or to do it as a career, I just wanted to build myself a very, very fun quiver. Although the desire marinated within me for a while, I never pursued it. I was newly married and I had “adult” things to do and take care of. But as my passion for surfing and surfboards grew, I began to entertain the idea of seriously making myself some boards. Luckily, I had a very loving and supportive wife that wanted to try and make it all work under the circumstances we were in at the time. The start of 2011 came and so did our tax returns. We decided to do the logical and mature thing and pay off bills. NOT! We split our return 50/50. I’m not sure what Tiana did with her half; probably something practical like pay off bills and buy groceries. She’s amazing like that. I, on the other hand, took every dollar from my half and got myself a few basic tools, a planer, a blank and some 2x4’s to build myself a shaping rack. I shaped my first board in the driveway of our house in Wai’ehu on March 31, 2011. Dust went everywhere; in the house, in the car, EVERYWHERE. For weeks. Tiana wasn’t too thrilled, especially because the dust’s favorite place to rest seemed to be in her eyes, LOL. After I shaped that board, I called a local glassing shop. I remember pulling up to the glass shop to find Bob “OLE” Olsen dropping boards off as well. Upon seeing him, I decided to sit in my car and wait for him to leave; no way was I going to bring my board in with a master shaper in the shop. Once I realized that he wasn’t leaving anytime soon, I eventually mustered up the courage to walk in my board. I thought I was going get laughed right out the door. To my surprise though, everyone at the shop was nice and respectful, only asking if it was my first board. After telling them that it was, Bob said to me kindly, “Most first boards come out too thin. Yours is the opposite.” We all had a good laugh. Tiana graduated college in 2013 and earned a degree in Psychology and Substance abuse counseling. However, shortly after having our daughter, Ezra, she lost interest in pursuing a job in that field. Everything changes when you bring a little human into the world. The glass ceiling of what we thought was love, was shattered. It expanded the definition of love and redefined everything for us. Our new understanding of experiencing, receiving and giving love through Ezra deepened our love for God, so this in turn deepened the passion and calling He has for us in board building. It took me off guard because she had never said anything remotely close to that before. Being the good husband that I am (LOL), I made it happen. In December of 2013, Tiana glassed her first board. She was a natural. By 2016, with the love and support of our amazing family, we made the shift to start building boards together full time. You learn a lot about yourself when you make a major life decision such as we did that year. People who know me, know that I am a perfectionist and that I can be fairly intense. It’s either perfect or it’s trash; there’s no in between. Sometimes I project that onto Tiana’s work, but most times I get down on my own. Tiana is helping me change that. Countless times I’ve come to her after working on boards, head hung low and feeling like a failure. Like I should quit. Like this has all been a waste. But Tiana is quick to bring me back to reality and remind me that this is all a process. That we are gifted and still refining that gift. Mistakes are lessons learned for the future and are a part of the journey, and Tiana and I are on a journey of trust. We trust each other’s gifts and abilities, and the path that God has us on. We trust the love that we have for each other and for God, and how that translates into every decision that we make. The road hasn’t been without its challenges, but we are thankful for the grace in it all. Every experience, every failure, every victory, and every hurdle that we’ve climbed over has taught us to not only be better board builders, but better people. 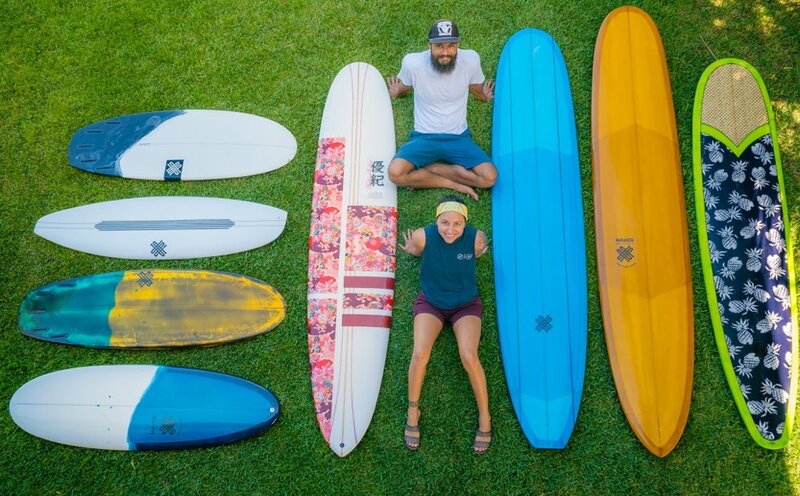 The cool thing for us is that we both have a shared vision and mission for Maker Surfboards, and we are unified in what our goal will always be: to Love. We aren’t building boards for the sole purpose of becoming rich. We don’t need to be one of the biggest brand names out there. We aren’t chasing sponsors, or going after the best surfers to ride our boards. We build boards for the love of the craft, driven by an overwhelming desire that needs to be fulfilled. It’s our passion. When we aren't building boards, we’re anxious to build boards. We build boards for the love of surfing and to get people stoked on surfing, even if they don't surf. And we build boards because we love God. We glorify Him through loving those who we make boards for, those who we surf with, and those who we will meet along the way.